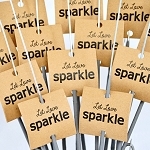 Light A Spark With Favor Kraft Labels! 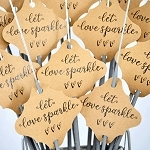 Our Custom Kraft Paper Wedding Sparkler Tags are a great way to "dress up" the sparkler display at your wedding! This classic style of wedding favor labels is designed to coordinate with any wedding theme and décor. Our labels for wedding favors are made of thick 98-lb Kraft Paper, so that they are durable and can be held onto long after the event for memorabilia. 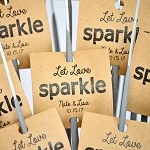 "Let Love Sparkle" is printed in black ink along with the Bride and Grooms names and the date of the wedding. 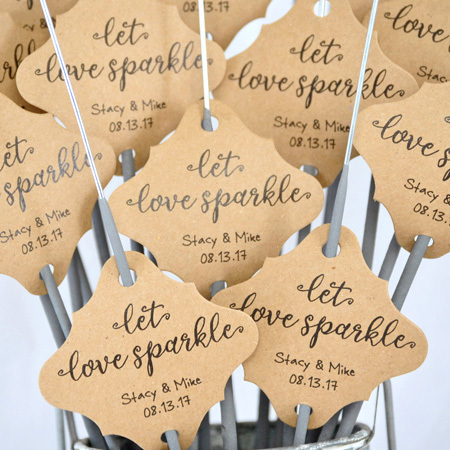 The tags are in a diamond shape and have a hole at the top and bottom of each tag makes it easy to slide each sparkler through. 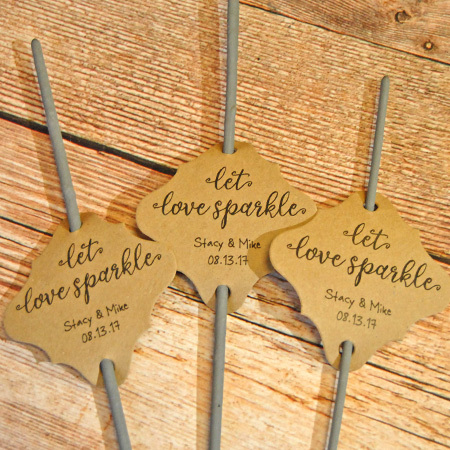 In addition, display your "tagged" wedding sparklers in one of our wedding sparkler buckets, available in galvanized or rustic finishes. Tags conveniently ship out in 2 to 3 business days because the tags have to be printed and cut. Custom tags are non refundable.